The fine people at Popular Mechanics recently published a book that deserves a prominent place on every retrofuturist’s bookshelf. 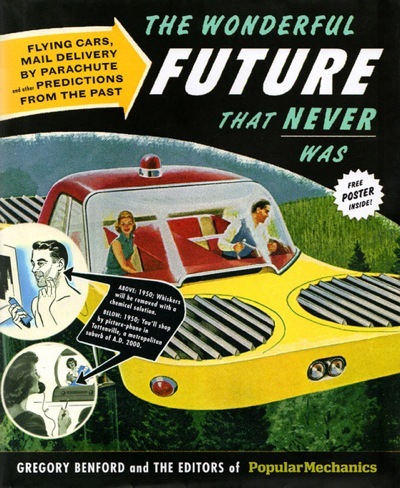 The Wonderful Future That Never Was by Gregory Benford looks at technological predictions that appeared in the pages of Popular Mechanics from 1903 until 1969. The prediction below was an attempt to address what was seen as an inevitable problem; how to land personal aircraft in busy cities. The solution here was to erect a gigantic landing port supported atop four skyscrapers. I have not read the book yet, but it looks great. Now watch this video on You Tube that I took today at 38th and Hiawatha, near my home. I call it “You Go, No You Go.” True, the traffic signal was out (just blinking red – treat it like a stop sign). It has been that way all week. But the similarities to the resulting behaviour was uncannily like that seen in the London example [ON THE BOTTOM, FROM A FEW YEARS AGO]. Believe me, a four way stop sign at that intersection is perhaps not the best long term solution, but…. …But allow me a moment to point out the “dance.” As you can see, the traffic is backed up to Lake Wobegon, but that’s not the point. At the actual intersection, everyone is taking turns and pedestrians and bikes are almost on equal footing, if you will. Everyone is stopping. Everyone is looking. The train goes by, the gates raise, cars cross north to south, the eastbound car and bus pull up to Hiawatha, pedestrians cross to the median, one of them dashing across the entire street as the northbound vehicles are coming across, It is a dance. A bit clumsy, but a dance. And a funny dance at times. You go, no you go. That’s what half the drivers seemed to be saying this week. They were used to zoning out there – red: stop, green: go. What the hell!? Now I have to think about it and be careful? I’m taking Minnehaha Avenue instead! As I watched the traffic before I started filming, one car pulled up to the blinking red lights, windows open. I could hear the passenger giving instructions – “who goes? who goes? OK go! Aaah, don’t crash!” Bikers especially woudl get to the intersection and look left, right, left again, behind, above! Trust nobody! As a biker taking my kids to preschool every day in the Burley, I have to say I kind of prefer it this way. I cross that beast of a street on a typical day, and frequently, while sitting on the island between the right turn lane and the traffic streaming by at 45 miles per hour, I feel, um, insecure. I have visions of how on earth to try and jump out of the way of an errant car, while still saving my children in the trailer behind me. It isn’t fun. Sure, it has been confusing for us this week, but at least at the intersection everyone is moving slow and for the most part, paying attention. I like that. I like that a lot. I am all in favor of Shared Space in the right context (e.g. campus, London). Unfortunately, an almost freeway (Hiawatha Ave) is not that context. Why do the pedestrians run? Not an improvement. The Aerotropolis: Will the Cities of the Future be Giant Airports? To most people, building an entire city around an airport probably seems like a terrible idea. First of all, airports just aren’t fun — especially in the US, they’re irritating places and filled with never-ending lines, over-priced food, and irascible TSA agents. And that’s to say nothing of the pat downs. Second of all, they’re usually sprawling, aesthetically offensive, and loud — most cities go to good lengths to relegate its airport to the outskirts for a reason. So why does John D. Kasarda, a University of North Carolina business-school professor, author and consultant, think that the cities of the future will be built around airports? Why does Kasarda insist that today’s successful metropolises will become tomorrow’s aerotropolises? It’s a city that’s built around an airport, the bigger the better, with factories and/or traders, both dependent on air freight, close by, followed by a ring of malls and hotels, followed by a ring of residential neighborhoods. The airport isn’t an annoyance, located as far out of the way as possible, but the city’s heart, its raison d’être. I think some cities will be airport based, but not too many. The advantages are few when most people fly once or twice a year. Even for those who fly more frequently, there is little need for it to be the center of the region (since the number of people flying into and out of downtown before and after work is quite small). Freight gains little advantage from centrality, where local streets are likely to be highly congested. The airport could easily be at the edge of the region, where the externalities are minimized. Further, cities could easily have multiple airports if demand is high enough, and the economies of scale small enough. Marasteanu said he believed the city was doing the best it could given budget constraints, but repairs will only get more expensive in the future if there isn’t enough maintenance now. The headline “assault on potholes” and its military metaphor is like the DMZ museum, where the South Korean military described its successive victories at points farther and farther south on the Korean peninsula. I will just add that the budget constraints are false constraints. City roads are in more terrible condition than County or State roads. Priorities are not set right (witness the city bidding for the Vikings stadium). There are lots of solutions to fund roads, and if people believed the funds would actually go to fix those bad roads, they would get support in many places (though not everywhere). Big changes are in the works to turn U.S. Highway 41 into an interstate, which Governor Walker says could mean more economic growth in the state. Governor Walker was in Green Bay Tuesday to make the announcement. The interstate would run 142 miles, from the Mitchell Interchange on I-94 in Milwaukee to where Highway 41 connects with I-43 in Green Bay. So how do you turn a highway into an interstate? And what does it mean for drivers? Transportation officials at the news conference said drivers won’t see much of a difference but the change will ignite economic growth because businesses will want to locate near an interstate. ‘Everybody thinks the interstate is like a brand, and then that brand says access, it says safety, it says speed, it says convenience. And we are essentially, you know, in this corridor, we’re affiliating ourselves with that brand,’ Transportation Secretary Mark Gottlieb said. ‘You’ve got an issue that makes it easier for cars and trucks to drive on. It’s certainly safety factors are built in which makes it a more safe corridor, and long term, not only for drivers, it will be good for businesses because it’s going to be easier to get on and off,’ Governor Walker said. The governor and the Secretary of the Department of Transportation explained the project could include widening shoulders, making median improvements, and replacing crossroads with on- and off-ramps. Some preparation work has already been done on Highway 41 with improvements in Brown and Winnebago counties. The upgrade could cost between $15- to $20 million, mostly federal money the DOT says would come from existing funds. ‘What we do is use it on focusing on the infrastructure that, for really for many of the last several years, has been largely ignored,’ Governor Walker said. The goal is to have interstate signs up in 2015. This would be interesting to validate, do otherwise equivalent roads draw different traffic or development simply due to the “Interstate” brand, or is this just hooey (a technical term)? I bought a round-trip ticket for a short train trip in the Netherlands, paying full price. Later I asked a colleague if there are discounts of any kind. Yes, she said, as long as you travel after 9 a.m. I assume this illustrates peak-load pricing, so I asked about traveling in the evening rush hour. It turns out the discount is good any time after 9 a.m.—there is no peak-load pricing for evening rush. I know of no U.S. transit system that has peak-load pricing only in the a.m. Is this because our evening rush hours are more compact than in Europe? My colleague suggests that this is one more manifestation of the long and regular hours worked by most Americans, as compared to Europeans whose workdays often end at 3:30 or 4 p.m. It’s hard to think of another explanation. Despite these differences, the Dutch rail system will shortly be changing this, disallowing the discount between 5 p.m. and 7 p.m. I assume this is an efficiency measure, since most trips are round, you only need to do the increase on relatively inelastic work trips once per day to have an all day effect. Sort of like tolling in only one direction. But there may be other explanations as noted in the comments.